We’ve reached the homestretch of summer and fall will be here in a matter of weeks. For a lot of us, that means a fresh start. Schools are back in session. Vacations have ended and it is time to get back to work. But fall in the northeast also means some of the most beautiful weather of the year and there’s still plenty of time for outdoor fun. That’s why you’ll see so many fall festivals in the coming month. There are many reasons to have a fall festival. It can be a late season corporate outing, or a welcome back to school event. A fall festival can serve as a fundraiser for your school, church or charitable organization, or a celebration of Halloween or the harvest season. 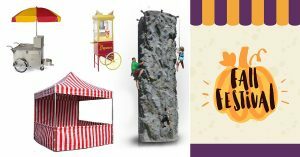 Whatever the reason you have for planning a fall festival there’s one way to ensure it will be successful; using products and services from NY Party Works. Putting a fall festival together requires a lot of planning. The website Hubpages recommends putting together a committee to discuss what needs to be done and to spread out the work. There are many things you need to acquire and if you’re having an outdoor event, you want to ensure that you have tents and chairs available. NY Party Works offers packages where we can rent one of our 20 x 20 tents plus one of our inflatables. We also have several sizes of tents including a 15 x 15 tent, for a smaller gathering, up to a large 20 x 60 tent. We’ll also provide you with chairs and round or rectangular tables. Many Fall festivals have carnival themes and NY Party Works can provide you with Carnival Booths, and rides like the sensational spinning Tubs of Fun. Inflatables are also very popular at fall festivals. If you’re expecting young children, bouncers such as our 20 X 20 Castle or play areas like our Frozen Combo or Justice League Combo will be a hit at your festival. If you anticipate having a more adult crowd, consider games like Hippo Chow Down, a giant version of the hungry hippo game you remember as a kid. Or you can have an adventure with our Zipline, which can send you 300 feet in the air. Or scale the heights of our 25 foot Rock Wall. NY Party Works can also help you with food and entertainment options. What’s a fall festival without food carts? We can satisfy your appetite with food carts such as hot dog carts, We can also give you popcorn machines or a popcorn cart, Cotton Candy Cart or you can rent a Slushie Machine. We’ll also provide you with DJs, MCs and dancers to get your attendees dancing and grooving. NY Party Works can also give you performers such as magicians and circus performers who will wow you. NY Party Works will wow all of your guests with our services and party rentals and we can handle all of the planning if you want with our Total Event Planning. Just because the weather is getting cooler doesn’t mean the fun has to stop. Contact NY Party Works today. Connect with us to learn more about NY Party Works. We can't wait to hear from you!